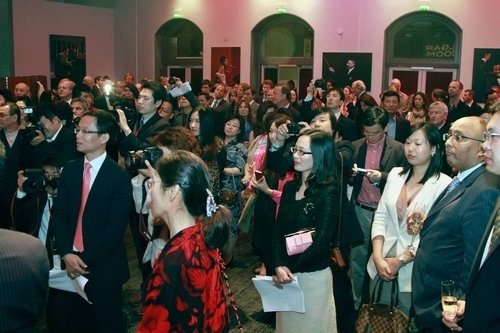 I wish you all a very warm welcome to this “East Meets West” Concert Reception. Tonight we have had a great example of how music can build exceptional bridges between nations. I wish to offer my warmest congratulations to the three great artists. Their first collaboration in London has been a truly stunning success. I believe this is a “wonderful concert” at a “wonderful time” and in a “wonderful place”. 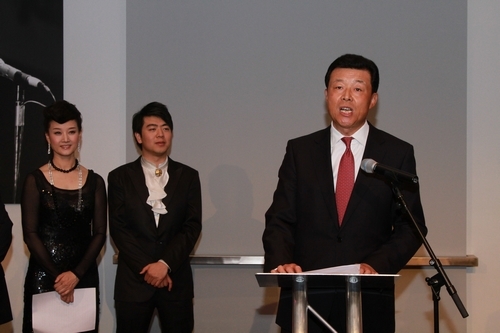 It took place at a “wonderful time” because this year marks forty years of China-UK full diplomatic relations. This is a time to review the past and look ahead to the future. From these reflections we must think about how to achieve greater advance in our relations. Both our countries agree that cultural exchanges are an important way to build deeper relations. Tonight provides proof of what culture and music can deliver. By “wonderful time”, I also mean it coincides with Diamond Jubilee celebrations. The concert added to the festivities of this propitious occasion. Our concert this evening was another way to convey all our best wishes to Her Majesty the Queen and the British People. On top of these, as we all know London Olympic Games is just around the corner. This concert carried forward the spirit of modern Olympics, that is “peace, friendship and progress”. It helps fulfill the London Olympic motto ‘inspiring a generation’. This is a “wonderful place”, because the Royal Albert Hall is world famous for the finest music and entertainment, which provides global leadership in musical standards. Tonight we have enjoyed a “wonderful concert”. I believe you all agree with me on this point. The applause from the audience said everything. I am neither a musician nor a music commentator. But, I do want to stress two points as a diplomat. First, tonight’s concert is a collaboration of some finest artists from China, Britain and Italy. Ms Song Zuying, Mr. Lang Lang and Mr. Bocelli are all exceptional world talents as soprano, pianist and tenor. I must say their collaboration was superb. We also owe the success of this evening to musicians and singers from the London Philharmonic Orchestra, the London Philharmonic Choir and the Royal Choral Society. For me, their performance has been perfection! Second, the concert tonight is a best example of East meeting the West in the musical arts. Listening to the concert, I found it difficult to tell what was Chinese and what was Western. The only thing I was sure about was they were singing Chinese folksongs and playing western musical instruments. I want to offer my special congratulations to the singers from London Philharmonic Choir and Royal Choral Society. I congratulate you on your excellent rendition of Chinese folk songs and your incredible Chinese language abilities! In conclusion, I once again most warmly thank the three artists, all the musicians and all the supporting staff that made this evening such a success.